Canada's first prime minister a tweeter? Since starting up in 2006, Twitter has quickly become one of the most popular forms of social media. Twitter is a website used to broadcast text messages – known as “tweets” – in 140 characters or less. It has over 200 million accounts, and its users write more than 65 million tweets a day. Twitter provides an opportunity for organizations, companies, individuals, and websites (like ActiveHistory.ca) to get their message out to wider publics. But living Canadians aren’t the only ones taking advantage of Twitter. Dead Canadians of historical prominence are too. Mackenzie was publisher of the Colonial Advocate during the 1820s and 1830s. He used the newspaper – that dominant nineteenth-century media form – to rail against the Family Compact and advance his beliefs in democracy and liberalism. So it’s not surprising that he would use Twitter to promote his political agenda. Except that he died in 1861. All of Canada’s dead prime ministers also have Twitter accounts, from Sir John A. Macdonald (@PMJAMacdonald) to Pierre Trudeau (@PierreTrudeau or @P_Trudeau). Predictably, banter between them heated up during the recent federal election, under the hashtag #deadPMattackads. These former leaders comment on current political issues from their own perspective. Following the recent announcement by Stephen Harper that embattled Conservative MP Bev Oda would continue to serve as Minister of International Cooperation, R.B. Bennett (@OlBonfire), Conservative prime minister from 1930 to 1935, tweeted: “Bev Oda is still in cabinet? Oh well, I kept Manion around, so who am I to judge” (Robert James Manion was Bennett’s Minister of Railways and Canals). Mackenzie King (@wlmk) has taken a different approach, tweeting selections from his once private but now public diary. He is followed by current Liberal MPs Justin Trudeau (@justinpjtrudeau) and Carolyn Bennett (@Carolyn_Bennett), themselves active tweeters. Other prominent dead Canadian politicians use twitter: Sir George Cartier (@sirgeocartier); D’Arcy McGee (@Darcy_McGee); British Columbia’s second premier, Amor de Cosmos (@AmordeCosmos1). Dead female politicians aren’t represented to a degree similar to men; then again, a lower ratio of women have served political office compared to men throughout Canadian history. Nonetheless, Agnes Macphail, Canada’s first female MP, tweets famous quotes and facts from her life, under the name @AggyMac. Some dead Canadians whose historical prominence came outside of politics also use Twitter. Samuel de Champlain, seventeenth-century navigator and founder of New France, tweets under the username @Sam_D_Champlain – in French, of course. It’s probably not surprising that Marshall McLuhan (@marshallmcluhan), media theorist and prophet of the electronic Global Village, uses Twitter to promote his own work. Stephen Leacock (@Leacocklapses), a McGill political economist remembered more for his humour writing, is a very active tweeter who quotes from his own work and other thinkers. But others, like Frederick Banting, Terry Fox, Billy Bishop, Sanford Fleming, and Lucy Maud Montgomery, haven’t picked up the Twitter habit. Alright. It’s a safe bet to assume that these dead individuals aren’t themselves doing the tweeting. Instead, Twitter offers a unique and often entertaining way to garner interest in the country’s history, especially to younger, tweet-savvy Canadians. In some ways, these Twitter accounts are the virtual counterpart of historical pageants and reenactments, as people today find those of the past – both “elites” and “ordinary people” – so captivating that they temporarily perform the assumed persona of these deceased individuals. Yet J.S. Woodsworth’s reflections illustrate that this practice also has relevance to today’s political debates. If Sir John A. has Twitter, why don’t you? It is nice to now be informed about Tweeting but I still really enjoy the printed documents. I guess these kinds of social media interaction gets more people to be aware of history which is a good thing. I will continue to use this site to make me aware of more quality books and articles to read. 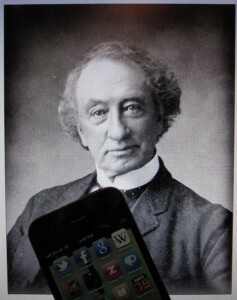 I believe I am a descendant of Sir John A MacDonald. How do i find this information?